Ageing is an inevitable natural process. You can delay it but can’t prevent it. However, it is up to you to age gracefully or to age wild. Although ageing takes a toll on your entire body, the most disturbing signs are indented on face. Taking measures as soon as possible can possibly reverse ageing, for instance; using anti aging products after turning 20. Korean skin care products sourced naturally, containing potent organic ingredients deliver promising results. Ever wondered how Korean women stay youthful & radiant even after crossing the age bracket of 50? The secret lies in their skin care regime that is no more a secret to be honest. The earliest signs of ageing are fine line & wrinkles, enlarged pores & loose skin that begins to sag (thanks to gravity). The responsible factors behind premature ageing are UVA & UVB rays, sleep deprivation & stress, facial mimicry & poor diet that includes consuming alcohol & smoking excessively. Although life style modification is required to successfully postpone ageing process, using Korean skin care products narrowly targeting your skin concerns have also been helpful, independent surveys suggest. Since Korean women have developed their own skin care routine that consists of “layering products” one over the other to maintain that envious glow, there is one product that they swear by to bring significant improvement. If you find yourself in conundrum situation when choosing Korean skin products to stay forever youthful then here is a good news, relax! Women who are sucker of lavish skin care products would definitely take the plunge of investing on a series of Korean skin products from essence to serums, emulsifiers, ampoules, toners, facial oils & moisturisers etc. On the other hand, if you are someone with little to no knowledge you may find it Korean skin care too elaborate to even begin. Don’t give up, just invest on one Korean skin care elixir and you will be a total convert! One Korean Skin Care Product that has taken World by Storm…. Ampoules. Hands down! Ampoules are under rated thus are not used conventionally. They are considered skin care luxury hence are ignored. Ampoules are actually super charged skin care serum and a type of treatment. They contain potent active ingredients, bear a light & thin consistency that enables an ampoule to penetrate deep into the skin in an effort to repair the damage. Although ampoule is formulated to spot fix & treat single skin care concerns, they can also address multiple issues from dehydration to dull & lack lustrous un-even texture, hyperpigmentation & ageing. As you begin to age your skin loses elasticity and begin to sag due to halt in production of collagen. Guerisson 24K Gold energy ampoule claims to reverse ageing, brighten your complexion & make it look more even toned, hydrated & radiant. Containing 24K Pure gold nano particles, it helps lifting skin. Gold makes skin look youthful & radiant. Containing hyaluronic acid, it makes skin look fresh & hydrated like babies. It prevents thinness of skin & improves texture. You don’t need painful fillers & hyaluronic acids injections when you can use the same topically at a fraction of the cost. Hyaluronic acid is also known to improving skin texture, reducing appearance of enlarged pores, improving fine lines & dry dehydrated skin. Containing Vitamin C, it helps brightening your complexion and reduces signs of photo damage by reducing hyper pigmentation. Korean skin care ampoules are highly concentrated. Although they may sound to perform the same function as of a serum, they are slightly more potent in terms of efficacy. They are ideal when you need an instant boost of hydration such as after surviving a long haul flight, after going through a surgery or during post-partum. 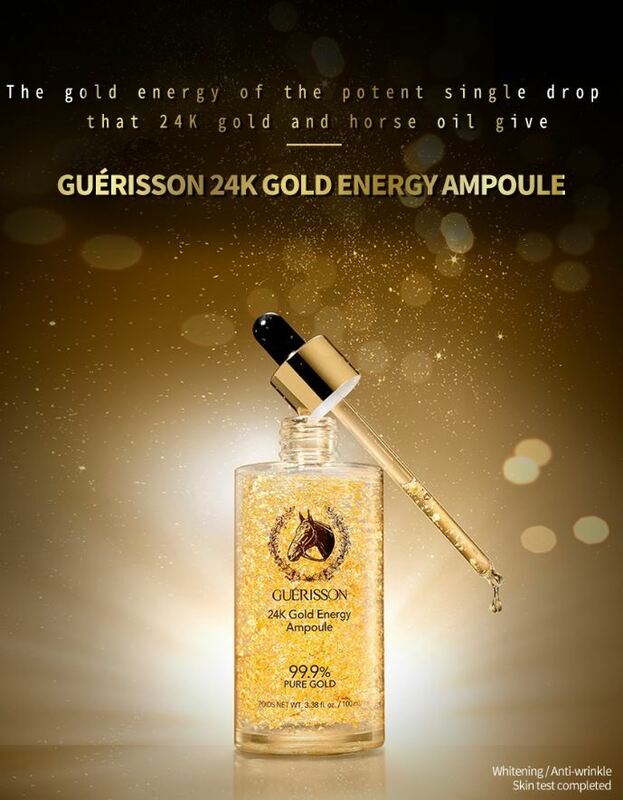 Guerisson 24K gold ampoule can be used daily and as a replacement of a serum. It is not only visually appealing but also a treasure to your everyday skin care regime. PreviousPrevious post:How to Increase Fertility in Men: 3 TCM RemediesNextNext post:Weight Loss with Sweet Tooth: How to Control Sugar Cravings? Can I use Coconut Oil both in Kitchen and Skincare?